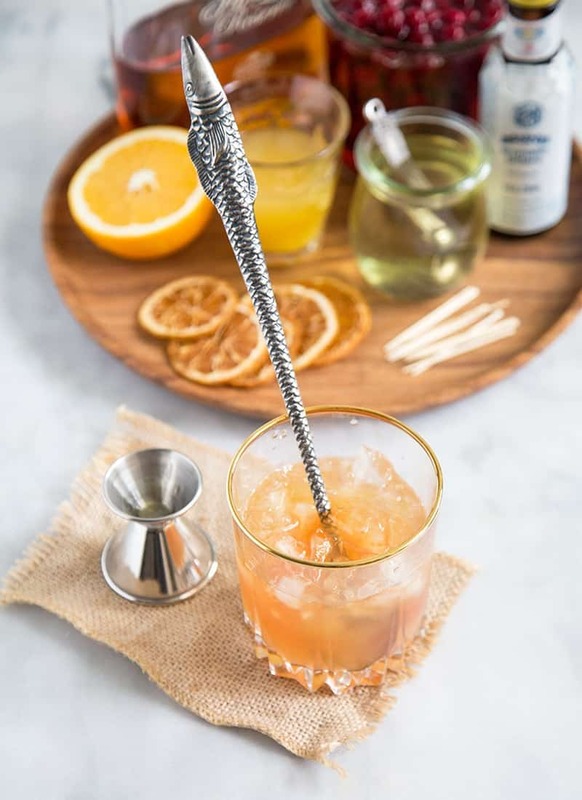 Fans of Old Fashioneds will enjoy this mellower Cranberry Orange Bourbon cocktail. I’ll have an old fashioned, please! That’s my signature drink. Without a doubt, unless we’re at a place that has fantastic wine, you betcha I’m ordering an old fashioned. There’s something about orange and bourbon that just works well together. However, one and half of an old fashioned and I’m out. It’s quite a stiff drink and that simply can’t do for the holidays. I need something a little more tame that will allow me stay awake and be festive and merry with family and friends. 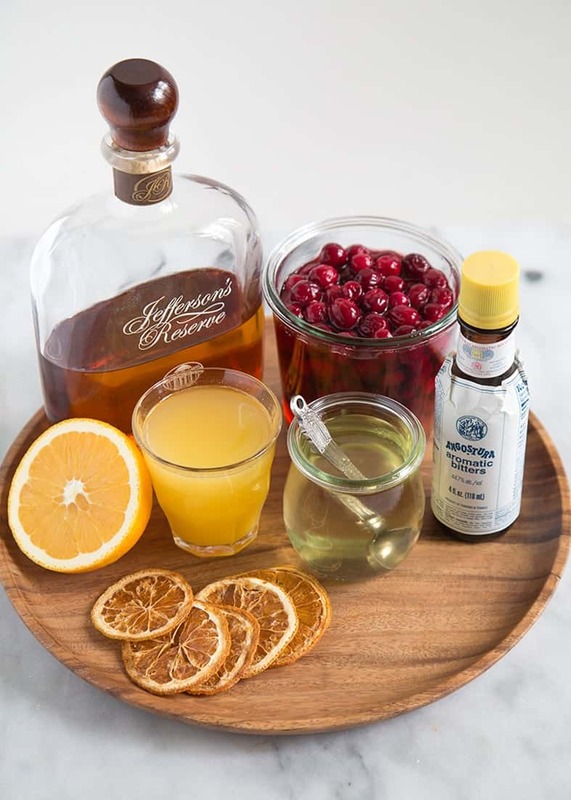 This cranberry orange bourbon is my stand-in cocktail this Thanksgiving. 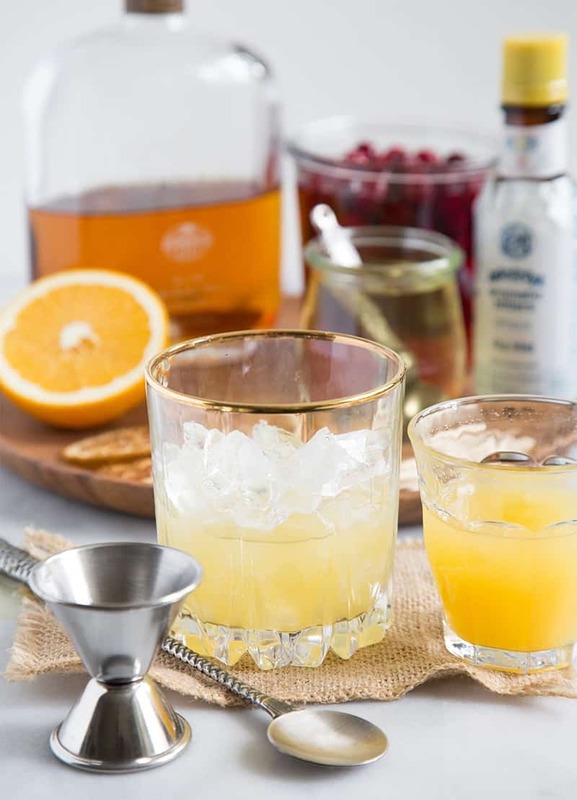 Playing off the orange and bourbon combination, this cocktail combines orange juice with my one of my favorite bourbons EVER, Jefferson’s Reserve. In keeping with the orange theme, I’ve used a simple syrup incorporated with orange peels and ginger. And finally, to top this fabulous cocktail, it will be garnished with dried orange crisps and brandied cranberries. Sound good to you? I’m a big fan of brandied cherries. I figure, if you can brandy a cherry, there’s no reason why you can’t brandy a cranberry. Since it’s the holiday season, an obligatory cranberry post is in order. I’m not the biggest fan of cranberry sauce (regardless of whether it’s homemade or canned), but Thanksgiving would feel like an ordinary Thursday without some cranberries on the table. That’s why last year I made this cranberry mint julep. 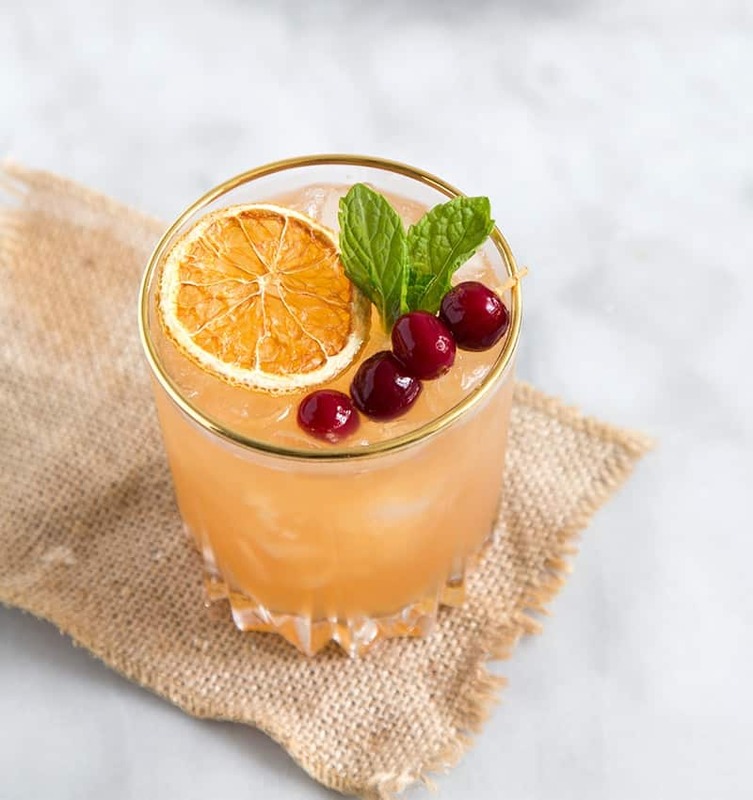 I’m keeping my boozy, thirsty Thanksgiving tradition going with this cranberry orange bourbon cocktail! Cranberries are tart. Even when you soak them in brandy, they’re still going to be a bit tart at the core. And that’s okay. Tart is good. This cocktail needs that little shock of brightness. 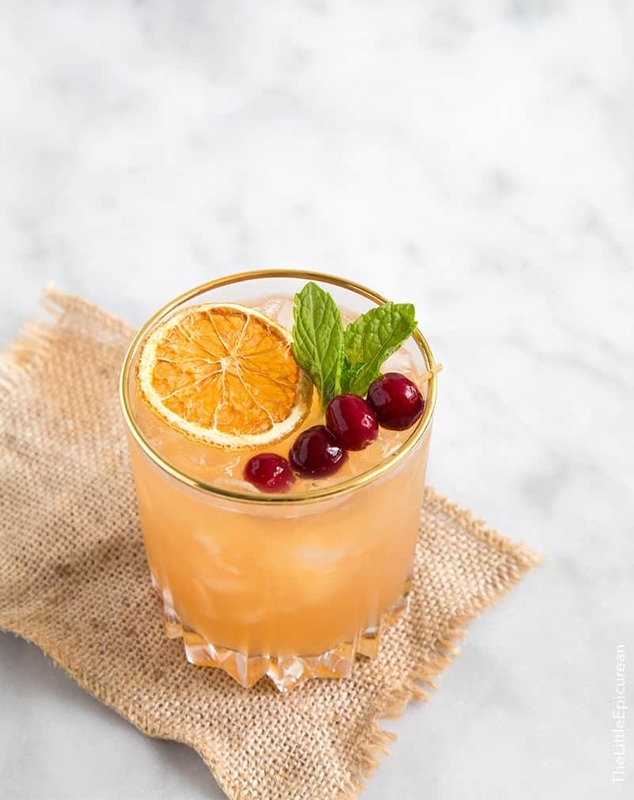 After you’ve had one too many servings of turkey, stuffing and mashed potatoes, you’re going to need a cocktail. Midway through the drink you’ll start getting food coma, so you eat the brandied cranberry floating in your drink. It’ll open your eyes. The brandy and the burst of tartness will wake up you. Those brandied cranberries will be that push that prevents you from falling asleep in front of the TV watching football. You’re welcome. 1.Gather all your ingredients. Fill a highball glass with crushed ice. 2. Add 2 oz of fresh squeezed orange juice. Fresher is always better. I like my OJ with a lot of pulp, but feel free to strain it out. 3. Add 1 1/2 tsp of orange ginger syrup, 1 1/2 tsp of the brandied cranberries syrup, and a dash of bitters. Stir to combine. 4. Add additional ice as necessary. Garnish cocktail with brandied cherries, dried orange crisp, and fresh mint. These dried orange crisps are from Simple & Crisp up in Seattle. I love them not only because they’re beautiful and tasty- but crispy! When do you ever get a crispy component in a cocktail?! Never. Unless you count the hors d’oeuvres you have in your other hand, but that doesn’t count because it’s not technically inside your drink. What are you going to be drinking this Thanksgiving? Mulled wine, sangria, margaritas? Fill highball glass half full of crushed ice. 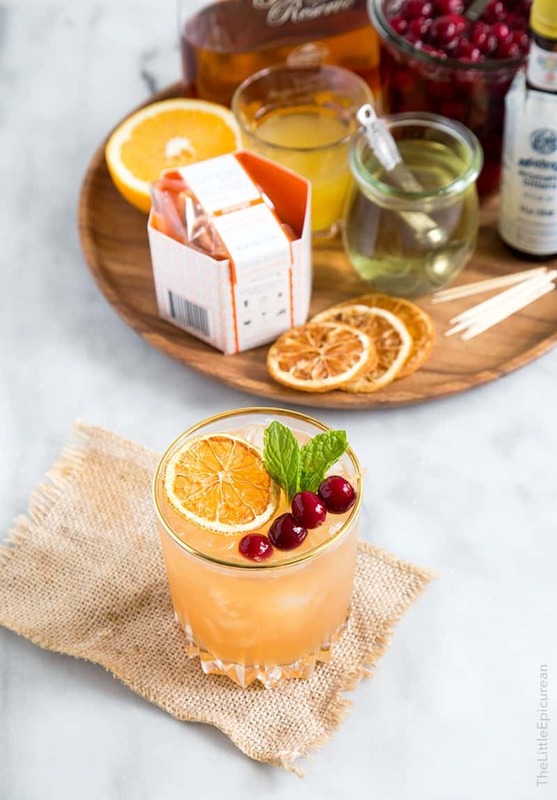 Add orange juice, bourbon, orange ginger simple syrup, brandied cranberries syrup, and a dash of bitters. Stir to combine. Add additional ice, if necessary. Garnish with brandied cranberries and dried orange crisp. In a medium pot, combine water, sugar, ginger, and orange peels. Bring mixture to a boil until sugar dissolves. Remove from heat. Cover pot with lid and let steep for 20 minutes. Strain ginger and orange peels. Transfer simple syrup to an airtight container and store in the fridge until ready to use. Keeps in the fridge for two weeks. In a small pot, bring water and sugar to a boil. Add cranberries and stir until coated in syrup. Cook for 30-45 seconds just before the cranberries start to pop open. Remove from heat and transfer to a 1/2 liter jar. Add cinnamon stick. Pour in brandy. Pour in enough sugar syrup to fill the jar. Cover with lid and let chill in the fridge for at least 48 hours before using. The longer it sits, the better it gets! If you don't have time to make brandied cranberries, feel free to use store-bought brandied cherries. Oh my gosh, I love everything about this! (Especially those orange crisps, those are addicting!) The cranberries are gorgeous, I am definitely adding this to my Thanksgiving menu! I would be a very happy girl having this for Thanksgiving. I think I would drink a bit too much in fact! Oh man…… this is the best sounding cocktail! Right there with ya about the old fashioneds. Since I’m going to my husband’s mom’s for Thanksgiving, I probably shouldn’t drink too many of those suckers. ha! I’ve been wanting to bring stuff for fancy cocktails that won’t knock us out. Thanks so much for the idea! My favorite part about this post is the fish spoon you used to stir the cocktail. Thanks Alex! lol didn’t you buy it with me? 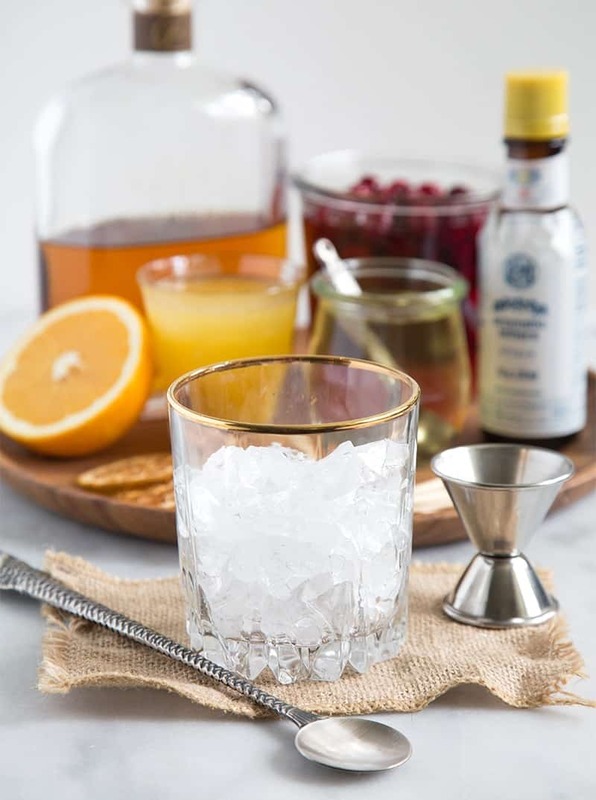 I know that making Old Fashions in bulk is pretty close to blasphemy, but do you think this could be made in a larger quantity and put in a pitcher for a cocktail party. I really don’t want to spend the party making individual drinks if I don’t have to, but this sure would make a statement! Thanks! This looks amazing! I’m thinking of making this for a group of 11 people (maybe 2 drinks per person), and trying to figure out how much of the simple syrup and brandied cherries to make. How much of each does this recipe produce? What would be your recommendation? 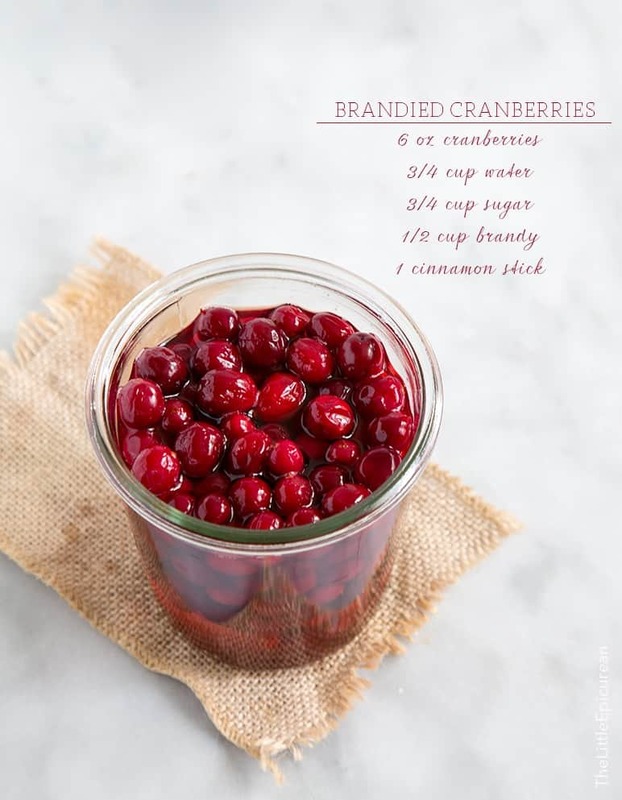 I suggest doubling both the simple syrup and brandied cranberries recipe.